A local locksmiths business, founded by ex-soldier and dyslexia sufferer, Eyan Maloney only four years ago, has been approved by the Master Locksmith Association. The Master Locksmiths Association (MLA) is the UK’s leading trade association for the locksmith industry, helping trainees work towards becoming vetted and fully inspected locksmiths. They offer an exam-based British Locksmiths Institute qualification, governing the standards of the industry. 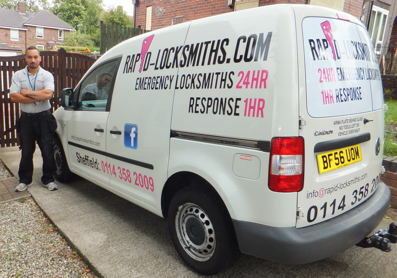 Eyan founded RapidLocksmiths, a professional 24/7 locksmith service in Sheffield, in 2012 after leaving the army. The move transformed Eyan’s life and the business has continued to go from strength to strength thanks to training provided by the Master Locksmiths Association. Having struggled academically due to his dyslexia, Eyan found himself signing up for the army at 15 years old after having enjoyed being in the cadets when young. While in the army Eyan’s dyslexia became a hindrance. He desperately wanted to transfer into the artillery but his limited academic qualifications meant that he couldn’t progress. With the hope of finding a career more suited to him, he left the army, went back to school and passed his GCSEs. Once Eyan had his academic qualifications under his belt, he started to think about career options. He realised that, due to his dyslexia, he would be well-suited to a practical career and he soon became fascinated by locksmithing. After deciding to invest in professional locksmith training and qualifications, he went online to find the best association and course, and opted for the Master Locksmith Association (MLA). Eyan said, “As a dyslexia sufferer it was difficult to find a career path suited to me. I knew I wasn’t going to be able to work in an office, but I love working with my hands, so locksmithing seemed the ideal option. “The MLA stood out as the obvious association to join, not only do they offer in-depth training but they provide a comprehensive support package too. As the leading trade association for the locksmith industry, the MLA has taken measures to help develop a nationally recognised locksmithing qualification linked to a formal apprenticeship to help combat the inadequate training some new locksmiths receive. The Master Locksmith Association’s training includes general locksmith courses, UPVC training, opening skills, a safe course, electrical safety course and connected security among other options. The association gave Eyan the foundation to excel through their industry leading training programme. They provided him with full support throughout, and having taken the BLI exam, as a qualified member he has access to a wide range of benefits including regional meetings, an online discussion forum, discounted vehicles, insurance and credit card processing, an ID card and a copy of members’ journal. All companies approved by the MLA are independently vetted, undergo regular inspections to ensure quality and employ a qualified locksmith with up-to-date experience and skills. As an Approved Company, the MLA will provide Eyan with free HR information, health and safety guidance, continued training opportunities, guidance on new legislation, promotion through their “Find a Locksmith” website and the use of the coveted MLA logo.